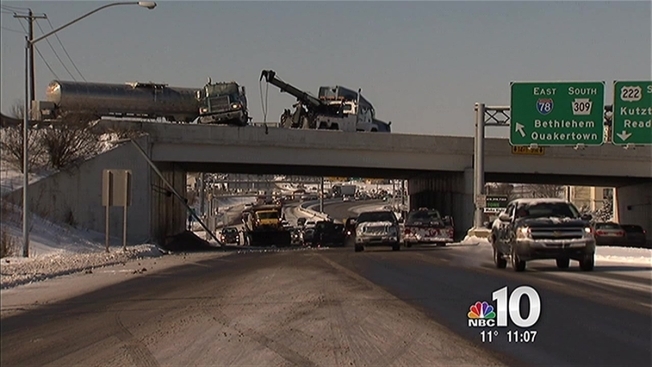 The cab of a tanker truck dangled over a Lehigh Valley overpass Friday morning. The wreck caused traffic troubles around 9:30 a.m. over the Hamilton Boulevard overpass of Interstate 78 in South Whitehall Township, Pennsylvania. The tanker wasn’t hauling anything when the driver lost control on I-78 and crashed partially over the barricade to the road below. Crews called in a crane truck to remove the cab. No word yet on what caused the driver to lose control.